Whenever my gas boiler is due a service, I get a sinking feeling in my heart together with a lighter feeling to my wallet. I pay a fee for my central heating system to get an annual service. However, every time the engineer from... let’s call it UK Gas... turns up, there appears to be something wrong with the system. Not wrong as in broken, but wrong as in not being to the latest specification. When Mrs G and I moved to this house some time in the last century, we had central heating installed. This was a central-heating system with a back boiler, so-called because the boiler was situated behind a gas fire. [Get away! - Ed.] When it was first installed, the fire had a small vent below it to ensure a good flow of air. Sensible idea. After a few years, this was deemed to be unsafe according to new regulations and we had to have an additional ‘grille’ in the floor to ensure a better airflow. More time passed and this too was deemed to be too small and therefore unsafe. A bigger grille had to be fitted. By now, we had a six inch by four inch hole in the floor. Not only was the air flowing well, so was a draught whenever it was a windy day. No matter; rules are rules. More time passed and, guess what... The six by four grille no longer met regulations. We had to have an eight by five grille instead. This was getting silly and, not surprisingly, breezy. After another couple of years, we were told that even this gaping hole in the floor was inadequate to allow a safe flow of air for the gas fire. The next step? A six inch diameter hole drilled through an outside wall. Now, this might be acceptable if you live in a fairly sheltered area, but the street I live, thanks to it being 590 feet above sea level, is often like a wind tunnel. When the wind blew, the hole in the wall allowed enough air in to cause the curtains to sway and ornaments rattle, such was its ferocity. Now if I were a more cynical type, I might be thinking that the reason UK Gas was making me put all these draughty holes in my floor and wall was to make my house more difficult to heat efficiently so that I would have to use more gas to warm the place up, thus increasing the company’s profits. That really would be cynical to even consider such a thing, though, wouldn’t it. I didn’t scream. I nearly did, but I held it back. Any road up, where is this all leading? [My thoughts exactly. - Ed.] A couple of years back we were told (by UK Gas, naturally) that our thirty something year old boiler was inefficient and that it would be difficult to get parts if it were to break down. If we were to get a new combi-boiler, our heating bills would be slashed; it being so incredibly efficient compared to our old system. We fell for it. Soon afterwards we were the owners of a super-efficient combi-boiler. We kept an eye on the bills which followed and, sure enough, they were much the same as we had been paying for our old inefficient system. Our old inefficient system that never seemed to break down, incidentally. I think you know what’s coming. Our super duper hyper-efficient combi-boiler broke down last night. Were any famous or notorious people born on the 8th of July? Of course. Here are some I’ve even heard of. John D. Rockeller 1839 (At one time, the richest man in the world. [Ah, but was he happy? - Ed. ]), Percy Grainger 1882 (Aussie composer. His most famous piece, however, was a reworking of an English folk song. First clip of the week coming up. You'll know this. ), Hugo Boss 1885 (Fashion designer and... what’s this? Nazi supporter? Well, I won’t be using his aftershave again, I can tell you. ), Louis Jordan 1908 (King of the jukebox, apparently. Have another clip. You might recognise this one. ), Nelson Rockefeller 1908 (Politician. Imagine that. Born 69 years to the day after his granddad. ), Billy Eckstine 1914 (Bandleader and singer. Known for his ‘suave bass baritone’. Here he is with Sarah Vaughan on their biggest UK hit. ), Jerry Vale 1930 (Italian/American crooner. Another clip? Why not...), Marty Feldman 1934 (Comedian and writer. ), Anjelica Huston 1951 (Actress and director. Daughter of John and grand-daughter of Walter. ), Kevin Bacon 1958 (Actor. I can’t name a single film he has been in. I have only ever seen him in those awful EE adverts. Blimey, he must be struggling. ), Pauline Quirke 1959 (Ectress. She first appeared on TV in an episode of Dixon of Dock Green when she was aged just eight. ), Joan Osborne 1962 (Singer. Another clip? Okeydokey. ), Bek Hansen 1970 (Musician known as Beck. Another clip methinks. Here's a track I always enjoyed. ), Todd Martin 1970 (Tennissy bloke. ), Ellen MacArthur 1976 (She sailed round the world. She was the female equivalent of knighted for doing it. [Damed? - Ed.] What? For doing something that no sane person would attempt, she gets honoured with a damehood. She should get her bumps felt more like. [I should like to point out that getting one’s bumps felt means having one’s head examined. Just thought I should make that clear in case you thought it meant... erm... something else. - Ed. ]), Robbie Keane 1980 (Oirish footy bloke.) and Virgil van Dijk 1991 (Dutch footy bloke.). Let’s move on to grambling matters. How did we do last week? We won. Yay! I say won. We got £2.87 back from our £2.20 stake so, at least we are in profit for once. What happened? York - 2.30 - Sainted - Won! Yay! Newcastle - 3.00 - London Prize - Won! Yay! Newcastle - 5.15 - Hadaaf - Won! Yay! Lingfield - 5.40 - Chelsea’s Boy - Lost! Boo! Doncaster - 6.25 - Sultanaa - Lost! Boo! Three out of five ain’t bad as Meatloaf might have sung... if he couldn’t count. I have to apologise to those of you who follow The Grambler’s betting advice; there is no gambly type prediction from The Grambler. Sorry to disappoint you both. How will we get by without our weekly gramble, I hear you ask. I’ll try and get him/her/it to come up with something a bit special next week. Teaser time. Yay! Last week I asked you which two English Premiershit clubs were docked points in 1990 after 21 of the players on the field were involved in a brawl. The answer was Manchester and Arsenal. I also asked who was the only player who didn’t get involved. That individual was goalkeeper David Seaman. He was probably frightened that someone would pull his ponytail. One for this week? Let’s have another Premiershit one. Since its inception which club has amassed the fewest points while avoiding relegation? Hmm... Interesting. And finally, Cyril? And finally Esther, I am indebted to a Mr. M. Feldman who during the 1960s was one of Britain’s most original comedy talents. He began his career at the Beeb Beeb Ceeb as Barry Took’s scriptwriting partner on Round the Horne, one of the best radio comedies of the era. Strangely, it wasn’t the Beeb that initially spotted his potential as a comedy performer, his first TV work was on ITV in a show called At Last the 1948 Show with John Cleese, Tim Brooke-Taylor and Graham Chapman. It was on this programme that the ‘Four Yorkshiremen’ sketch was first aired; long before it was used by Monty Python’s Flying Circus. 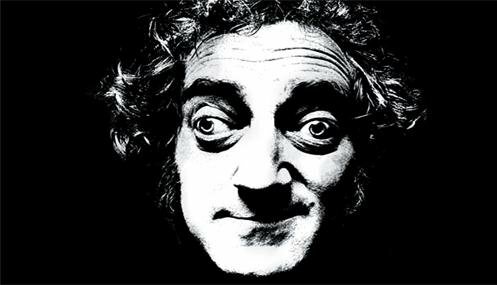 Any road up, after that single series, Marty Feldman was given his own comedy show on the Beeb called, imaginatively, ‘Marty’. It wasn’t long til Hollywood came a-calling and he appeared in a few Mel Brooks films, most famously as Igor in Young Frankenstein. He died at the far too young age of 48 from a heart attack. Often drug use has been cited as a contributing factor, but it is more likely that his heavy smoking, combined with a fatty diet and consumption of copious quantities of coffee, was mainly to blame for his early death. There are so many wonderful examples of his humour which I could use to end this week’s (g)ramble, it is almost impossible to choose. Do I go with his brilliant work as a scriptwriter for Round the Horne? What about his later film appearances? No, for me, his greatest material was his own original BBC series, Marty. Unfortunately, as happened back in the sixties, much of it has been lost because the Beeb’s money men deemed that video tape was too expensive a commodity to use only once. So sad that some cracking sketches are nowhere to be found. I have, however, been able to find a link to an hour’s worth of material. All I can say is enjoy watching a hugely talented comic at work. And finally, finally here is my own favourite Marty Feldman sketch. The video is nowhere to be found, but this audio version was issued on a record (together with extracts from The World of Beachcomber, Round the Horne and The Frost Report) which I bought in Woolies when I were but a nipper. I think I knew this one word for word. I love the way these two old guys build up the picture of their recently departed friend. Again, I invite you to enjoy some rather clever comedy.